HONG KONG, Apr 27, 2018 - (Media OutReach) - When we get sick, we always have a perception that should be taken any oily foods anymore and should eat more vegetable. However, have you ever think that eating too much vegetable, especially at the time if you have diagnosed with cancer, might reduce your survival time? 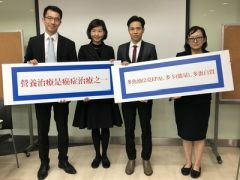 Food Medicine Lab, a division under Sponge Creation Lab, the medical culinary consultancy company, have conducted a "The Diet of Cancer Patients in Hong Kong" survey from December 2017 to March 2018, which successfully received replies from 53 cancer patients or their carers, who were all aged 18 or above by either telephone interviews or online questionnaires. The survey found that over 85% of the respondents in Hong Kong only ate porridge and vegetables as their main meals each day. One-quarter of the cancer patients have quitted eating meat after diagnosed with cancer and have believed that they should not eat red meat during cancer therapy. The patient, Ms. Chen said: "My friends and relatives all advised me I should not eat beef and mutton anymore as these meat are carrying lot of "poison substances" which will affect my cancer and let the tumors grown and spread faster. Dr. Donna Chow Lee Shu Ngar, Clinical Oncologist, said that nearly 30% of the respondents did not know that the survival rate of patients can be improved if nutrition therapy can be combined and started together before and during the chemotherapy. The Asian concept of eating plain rice during cancer treatment are totally wrong. She pointed out that "the relative risk of death increased by 7% for each 5% decrease in body weight, thus, weight stabilisation during chemotherapy may prolong overall survival of patients with cancer." During chemotherapy, radiotherapy or combined therapy, if patients are under weight or malnourished, oral supplementation would be recommended accordingly to ESPEN guideline. Dr. Peter Chan Chi Moon, Specialist in General Surgery and Council member of Hong Kong Society of Parenteral and Enteral Nutrition, pointed out: "In addition to chemotherapy, radiotherapy, targeted therapy and surgery, nutrition is also a therapy that cancer patients should not be overlooked." A reduced nutritional status at the time of surgery is known to be associated with a higher risk of postoperative complication. Also, artificial nutritional support has been proposed as an essential part of preoperative care of malnourished surgical patients. Special nutritional supplements which fulfil the special needs of cancer patients in terms of metabolic substrates are available. These specific supplements are distinguished by their high content of energy, protein and fat. They also have a high content of fish oil having fatty acids of EPA. Food Medicine Lab was established in June 2016 to review, study and collect latest medical studies and findings as well as carry latest surveys and public opinion on topics which could be of interest to medical, culinary, academics, journalists, policy-makers, non-profit organisations, patient groups and the general public. Food Medicine Lab was at first under Food & Medicine Department, a unit under Sponge Creation Lab, a reputable medical & culinary consultancy service provider, and now serve as standalone branch unit since 2016 to work direct with different medical and patient groups to initiate different programs and offer assistance and support to different organisations, patient groups and general public in sustainable diet change and wellness monitoring. Nutrition is a therapy and nutritional supplements distinguished by high content of energy, protein and EPA are recommended for cancer patients.